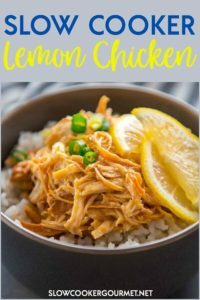 Slow Cooker Lemon Chicken is a simple dinner that can be started in the slow cooker first thing and you can come home to a delicious dinner! Lemon Chicken is just the ticket for a tasty meal that won’t leave you feeling guilty for overindulging! I decided I didn’t want to be tempted by having too many snacks around and my resolve actually lasted a few days including through my last shopping trip. Now I’m sitting here eating stale tortilla chips and thinking I may have gone a bit overboard in my attempt at super healthy eating. There has to be some balance right? 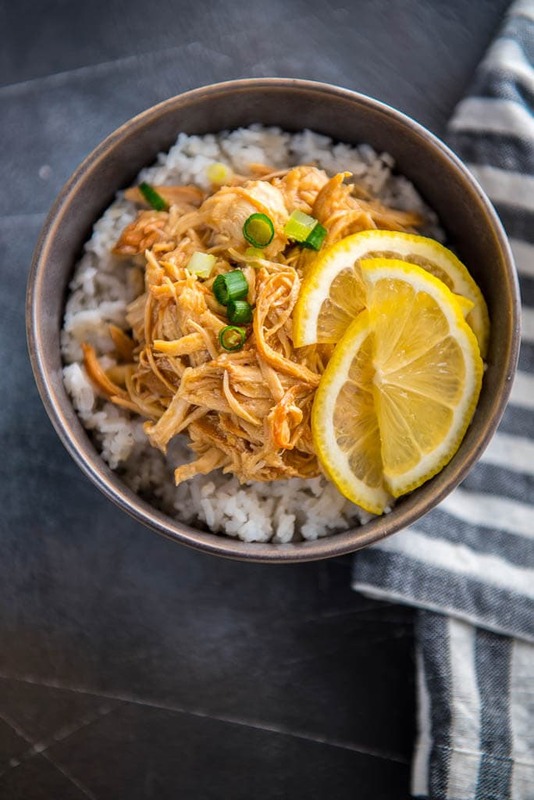 And since we had this healthy Slow Cooker Lemon Chicken for dinner I’m totally entitled to a handful of Reese’s Peanut Butter Cups as long as they are mini ones. Am I right? 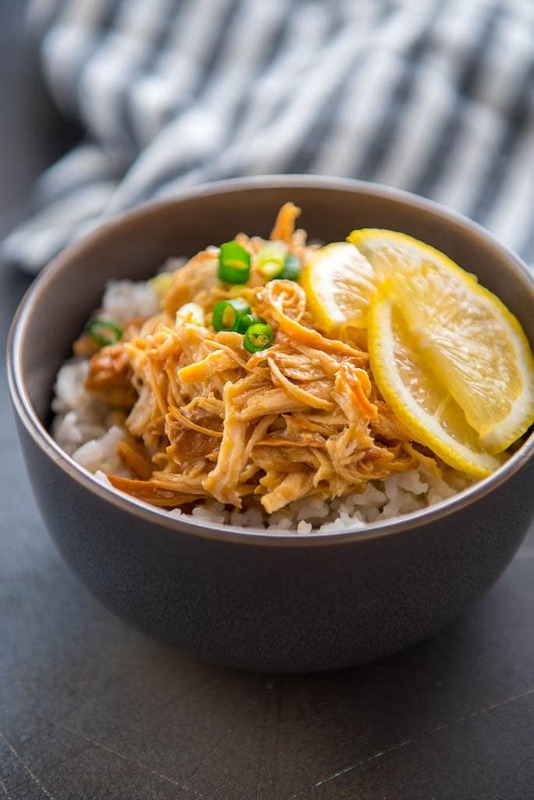 Why Slow Cooker Lemon Chicken is the best! 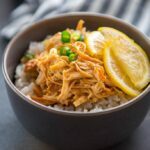 Easy, healthy, and can even be fairly quick on a day where you remember at lunch time that you wanted to throw something in the slow cooker (provided you can run home of course!). This took 3 hours on high in my 3.5 quart crockpot. I used boneless, skinless chicken breasts since that’s what I had on hand. Or at least what I had left after I had to throw away about half of what was in my freezer when it decided it would rather be unemployed. You could use bone-in and remove the bones or even boneless skinless chicken thighs would be good. Mix up a super simple sauce with stuff you may even have on hand. You could mix up the sauce the night before and just throw it in the crock in the morning with the chicken and be out the door in no time. The only work to finish it up is to shred up the chicken! So easy! I made some rice in the rice cooker and it was one of our favorite kind of meals-in-a-bowl. 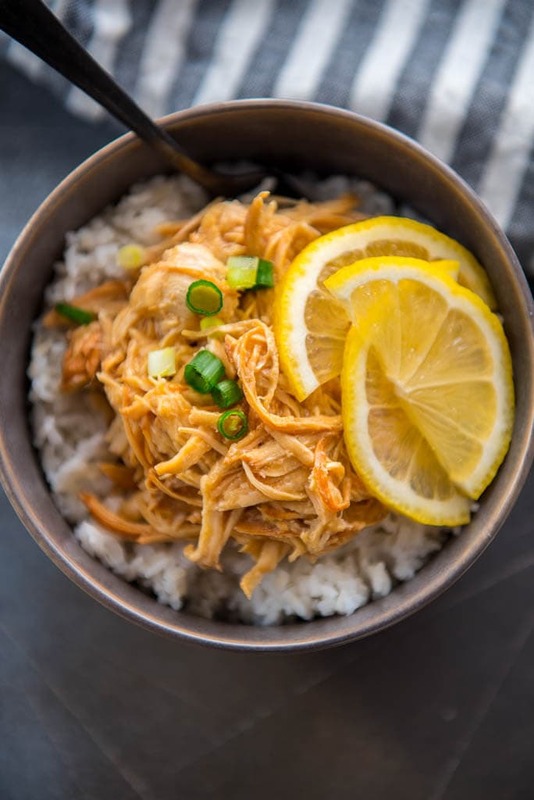 Slow Cooker Lemon Chicken is a simple dinner that can be started in the slow cooker first thing and you can come home to a delicious dinner! Lemon Chicken is just the ticket for a tasty meal that won't leave you feeling guilty for overindulging! I get the request to make this one every few weeks at least. We like it over couscous and I often add basil at the end as well. Hooray! So glad you like it! I think I’ll try this in my Instant Pot. Should take about 8 minutes once it comes to pressure, then let it release pressure naturally. I’ll increase the chicken broth to 1/2 cup or so to make sure there’s enough liquid and wait until it’s done to use the thickener. This looks great! I’d like to make about 3 pounds of chicken. Should I double the recipe? Yes, I would just double everything! Any suggestions for how to use the leftovers? Perhaps a casserole? Hi Lisa! Yes, you could use this anywhere you would use leftover shredded chicken. Casseroles, wraps, etc. But I would actually suggest to make tacos! With some creamy slaw and some Sriracha, these would be really good! This turned out perfectly for me! Delicious! I used it to make chicken tacos…so good! The leftovers were great on salad too! Tacos! That’s genius! So glad you loved it! Unfortunately my sauce had reduced to nothing – the opposite of the usual slow cooker problem! That meant the soy sauce was the predominant flavour and I couldn’t taste the lemon 🙁. We enjoyed it but next time I’ll leave out the cornflour addition as I can always do that at the end to thicken the sauce if it needs it. What if I am using 2qt sc? Is recipe same? Should be about the same, but may take a little longer to cook.